I told you my buffalo obsession was getting out of control. Obsession is so overused though. But nothing else in the thesaurus seemed fitting. Passion? Do I have a buffalo passion? I guess we can roll with it. Given my… passion… with buffalo-style, well, everything – I’ve branched out. It’s not just about chicken anymore my friends. Things are getting serious. The other pressing issue is my infatuation with sweet corn. I mean, I think it’s been bad every other summer, but this year it is really bad. I can’t wait to get my hands on the good stuff that comes off the stalk, but here I have to wait until maybe even August for that. So I supplement with whatever I can find. Worth it. 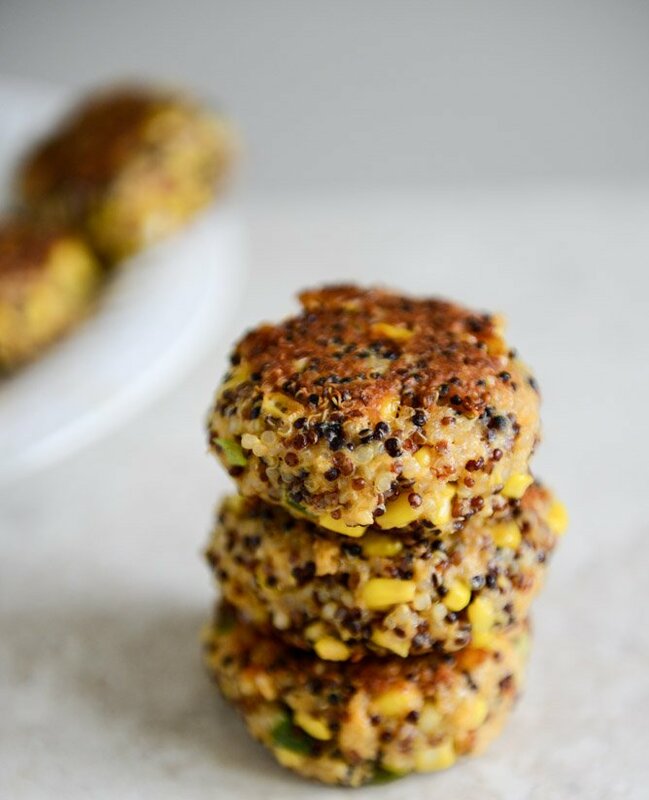 Quinoa patties, let me count the ways that I love you. 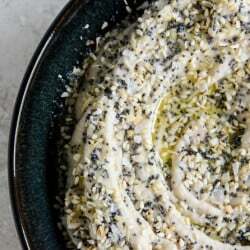 I don’t care if this stuff is super trendy or just a fad – I like it because it essentially almost takes on the taste of whatever you pair it with or whatever you’d like it to. It crisps up and you know how I need texture in my life, preferably crunch crunch crunch that does not have anything to do with vegetables. When made into patties, these little things can be eaten with side dishes or on burgers or in salads or as snacks. It’s just… endless. There is a little buffalo wing sauce (I used Frank’s Buffalo Wing, by the way – nothing else and not the original Red Hot) inside the quinoa patties, but I really wanted the corn to shine. There is enough cheese that it’s cheesy though. Obviously. Enough cheese so it’s cheesy. Huh. I’m just killing it in the description department today. I don’t even remember the first time I ate quinoa, but it was long before I even knew what a blog was. Well, back then, I thought a blog was just something that emo girls wrote their depressing feelings in online and then tried to share through My Space. I had a My Space account for like a total of seven minutes and hated every second. Unlike most other things in my life though, I didn’t try quinoa because everyone else was eating it – I don’t even think people were eating it then. I mean I’m sure SOMEONE was eating it but, yeah… you get it. I didn’t try it to be cool, like I do with coffee. And like I did with Game of Thrones last night when I just had to watch the last ten minutes of the most recent episode so I could be up to date on pop culture. Gah. You know I can’t stand it when I don’t know what’s going on. And of course, it meant absolutely nothing to me because even though I’m a gigantic slave to HBO programming, after the first season I just couldn’t handle it. Not my style. Seriously, if you even think you know me, then you’re well aware that there is not enough girly girl crap, bad acting, tacky love scenes, unrealistic romance and annoyingess on that show for me. Basically, it’s not chick-flick enough. And stop looking at me that way. I always tell you I have terrible taste. At least I know who I am. Anyway – these sliders. Cute, crunchy, piled with cheese and wing sauce and tiny. Which means you can eat as many as you want. Just do it. In a large bowl, combine quinoa, corn, scallions, garlic and cilantro. Mix well to combine. Add in cheese, panko, flour, salt and pepper, tossing again to mix. Stir in eggs and buffalo wing sauce until the mixture is moistened, then using your hands, form patties by pressing the quinoa together. I literally squeeze it together into my hands and form a patty, smoothing out the sides. Set the patties on a cutting board. Heat a large skillet over medium to medium-high heat and add olive oil. Add sliders and cook until crispy, about 3-4 minutes per side. Once golden on both sides, add some cheddar on top and cook until it’s melted. To assemble sliders, place patties on the buns and cover in additional wing sauce. Eat! What could be used as an egg/binding substitute ? I don’t do dairy, as dairy doesn’t do me. I use a “Fake Egg” in baking. Try it! Any idea on how these would work without the flour and breadcrumbs? These look delicious but my husband can’t eat gluten :( We just found out so I am not totally educated in gluten free stuff…. I want to make these so badly! Could I use sweet corn from a can? What type of cooked corn do you use? Using the recipe as is, my sliders fell apart in the pan. I cooked 2 the put the rest in a food processor and pulsed it. Formed perfectly delicious patties after that. Made these tonight bc I’m so not okay with the freezing temps and felt my family needed these sliders to pretend it was Summer. Not that slider equals Summer but burgers do so I know someone gets that. Great recipe! Super easy and big on taste – win, win! Thank you! Bring on the buffalo sauce! These were so delicious! They were very easy to make and came out perfect. Thank you! My boyfriend and I gave up meat for Lent so we’re trying some new vegetarian options. These were simply DIVINE. I can’t wait to make them again. I told a friend who has also already made them and loved them as well. Thanks for the great vegetarian option! I don’t think I’ve ever commented on a food blog before, but I wanted to take the time to tell you that these are incredible. There was a little trial and error for me getting them to stick together but once I got the hang of it, it wasn’t too hard. They were absolutely delicious, and the texture was perfect. My husband and teenage son are sometimes skeptical about new things, but they both ate these up. Well done! These are good but so incredibly frustrating to make. What is your secret so that they don’t fall apart? This is the third time I’ve made them and ever time several of them fall apart and I end up getting so frustrated while cooking.